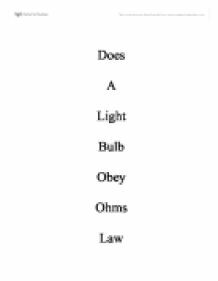 Does a light bulb obey Ohms law. My aim is to carry out an investigation to find out whether a filament light bulb obeys ohms law. I am carrying out an experiment to find the different resistances and currents created by a light bulb at different voltages. 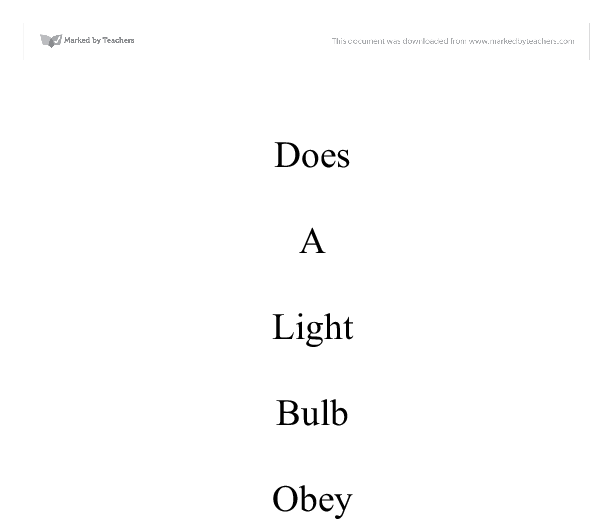 Because of the light bulb, it glows white-hot when fully on, the resistance will change at different voltages. When the voltage is low and the bulb is not very bright, it won't be as hot and therefore it will have less resistance. But when the current is high and the bulb is brighter, it will have a high resistance. Ohms law suggests that if you were to increase the P.D (potential difference) across a resistor then the current flowing through a resistor will increase. This means that the current would evenly go up as the P.D increases. This is a device that measures the current of electrons in Amps. It has to be placed in series on the circuit. I will put together the circuit by using the equipment I mentioned before. I will join the ammeter and voltmeter to the power pack using wires and join the light bulb to the ammeter and voltmeter using wires. I will record the results every 0.5 volts. I will record the results shown on the ammeter. To ensure my experiment is a fair test I will use all of the same equipment for the whole experiment. This is because each piece of equipment has their own faults in them. If I use a consistent set of equipment then I will have a more consistent group of results. I will measure each voltage three times so I can get a wider variety of results. Because we are working in a classroom there are some problems which may affect our results inaccurate equipment, old equipment, room temperature and lack of space to work with. To improve the experiment, I would probably have to be really professional and a lot more scientifically precise in how I carry out the experiment. I would need to make sure there is a consistent classroom temperature, as changing temperatures may affect the filament's own temperature. If I had more time, I could try the investigation with different equipment to what I had already used. This could prove that the equipment I used doesn't matter in the experiment, and it's the fact that how I carry it out which is key. To extend the project further, we could carry on the voltages to twenty, or twenty-five to see what happens to the results and graphs then. We even could carry the experiment on until the filament melts, and see how much voltage it can take. Also, we could add a lamp or two into the circuit and see if this affects the resistance in any way. Maybe instead of a power pack, replacing it with a couple of cells and also adding a variable resistor into the circuit. * Be careful when the wire is connected, as it will get hot. * Make sure that the current is going from the positive pole to the negative pole by connecting the right pole. Apparatus: Resistance is the force; it's proportional to the voltage across the resistor and opposes the flow of an electric current around a circuit. Because the temperature and current were not constant, the filament lamp is not an ohmic conductor. The gradient of the curve is very small at the beginning showing that there is little resistance. The aim of our investigation is to investigate Ohms Law. Step 3- Switch the power pack on and record the voltage and current Step 4- Turn the power pack off and move the crocodile clip to 90cm Step 5- Turn the power pack back on and record the Voltage and Current for 90cm Step 6- Repeat this for 80cm, 70cm, 60cm, 50cm and 40cm. Voltmeter: To change the voltage in order to change the current. Three components, which are: i. Light bulb ii. Thermistor iii. Metal wire I will use a variable resistor instead of the metal wire to give a constant length of the metal wire. 1.70 1000 4.25 1.80 1000 4.27 1.90 1000 4.30 2.00 1000 4.31 Using, the results above I will plot a line graph in order to calibrate my sensor. By doing this I can estimate the Voutput when the light bulb is placed 13cm from the graph of 155cm. and the same method every time I repeat the experiment so that nothing will change. The electrons fill the holes. Those holes and free electrons cease to exist, and new holes and electrons spring up to take their place. The effect is that current flows through the junction. A device that blocks current in one direction while letting current flow in another direction is called a diode.